An informal sport fishery has popped up in Kodiak. For crawdads. They’re crustaceans that look like little lobsters, and they’re native to the Pacific Northwest. But in the last few years, they’ve been found scuttling along the bottom of a popular fishing area near Kodiak, in the Buskin River watershed, mainly in the lake. In 2002, local groups noticed the invasive species in local waters. Now, a local tribal organization is studying their movement, distribution and diet. They are concerned the crawdads could be snacking on fry and disrupting salmons’ natural environment. Next to Buskin Lake, four guys pull on neoprene wetsuits and snorkeling masks. They’re gearing up for the hunt. “Man, I’m ready to slay some frickin’ crawdad right now,” Ryan Gabor said. Gabor and some friends have put aside the day to snorkel for the mud-colored crustaceans. They’re called a variety of names throughout the world including: crawfish, crawdads and crayfish. Kelly Krueger, tribal biologist with the Sun’aq Tribe, calls them by their proper name: Signal Crayfish. She says they’re not certain how the crawdads came to Kodiak, but she says people started catching them as early as 2015. “And I think it was because the Kodiak Soil and Water Conservation District and Blythe Brown, she was putting up signs that if you know of anything let us know, and then people just started looking for them and once people found out that they were in that southeast corner of the lake, then it kinda just exploded, and people have been snorkeling for ‘em, setting traps, and even scuba diving for ‘em,” Krueger said. The more people removing the crayfish from the Buskin, the better, Krueger says. Day trips to snorkel for crawdads are fun in the Kodiak summer, but the Sun’aq Tribe is concerned about the long-term effects on salmon and their habitat. In 2016, the Sun’aq Tribe and the Kodiak Soil and Water Conservation District teamed up to determine just how much of a presence crawdads have in the Buskin River. The Sun’aq Tribe has since taken the lead on the project, which is funded with a grant from the U.S. Fish and Wildlife Service. Krueger says the Buskin is a popular subsistence salmon fishing stream along the road system. Hypothetically, Krueger says, people could have shipped them up for a crawdad boil or as pets and then released them. One female can bear hundreds of babies in her lifetime. The Sun’aq Tribe is turning to locals to get a sense of the problem. 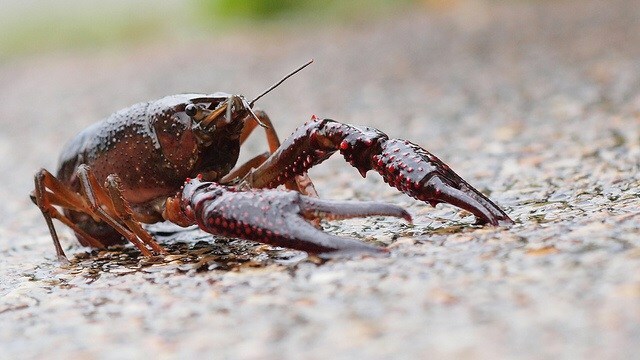 Staff posted a sign up by Buskin Lake asking for people to report the number of the crawdads they catch and how many females with eggs they capture. It would be hard to make a dent in the population, according to one crawdad hunter, Miguel Zarate. Zarate was in a local store, Scuba Do, when Ryan Gabor and his friend dropped by to rent their gear. While there, the gang also picked up a plastic raft. Motorized boats are not allowed on the lake because the Buskin is on Coast Guard land, and it’s also the source of drinking water for Base Kodiak. The raft carries the cooler and serves as a tender where the snorkelers can dump their stash of crawdads. Out on Buskin Lake, the gang dives down with bags made from nets and cinched at both ends. Once they filled the bags with crayfish, they pop back up to the surface and empty the crayfish into the cooler. The crayfish are fast. They’ll use their tails to propel away if they can. But Pearson Brodie says he’s having success. They’re only out there for a couple of hours before they have a large cooler full of crayfish. Brodie swims over to the raft and lifts the cooler lid. He sees hundreds of crayfish writhing around inside. The group meets Kelly Krueger with the Sun’aq Tribe and some of their local partners back in the parking lot. Krueger says in September, the Sun’aq Tribe will look at whether crayfish have also spread into deeper areas of the lake — trying to learn more about them in order to find a long-term solution. In the meantime, Kruegar says they can use all the help they can get from people like Ryan Gabor and his friends. Later that day, the guys gather at Brodie’s house, where they set up a pot of boiling water and drop the crayfish in by hand. Previous articleIce Race – Who will be active in the changing Arctic landscape?